The last four months of doing business as Gerard Aflague Collection has been positive – overall. We’ve attended three large island-themed public events in California and Colorado, are working with Faith Bookstore in Guam to retail our products, and have served customers online from Guam, Saipan, throughout the mainland, as well as Germany and Japan. We look forward to networking with more folks…with a wider audience. We are doing just that. We’ve begun working with the Facebook group 671 Recipes to connect with over 20,000 subscribers to spread the word about our work, and we are working with smaller stateside contacts who retail their goods at local events all across the mainland. We see our efforts to connect being nothing but a positive experience. We’ve seen what the power of social media can do in terms of connecting us. We’ve been very encouraged by many folks who have mentioned that we are doing a good thing by creating beautiful things that personify our pacific island lifestyle, culture, and heritage. But we wanted to do more. We began to offer inspirational products. But this still wasn’t enough in our minds. As we thought about what we were doing, we asked ourselves how hard would it be to give back a small percentage of our sales or in-kind donations to help the homeless situation in Guam. So we entered into conversations with the Salvation Army in Guam and came to understand the connection between drug addiction and homelessness. While they receive grant funding for their efforts, they could always use the extra help from other sources. So starting in mid-August, we will be donating a portion of our sales to the Salvation Army in Guam to assist the homeless. We are happy that they were receptive to our call. We hope that giving back to our island home in our small way will bring about some value to their great efforts to support our island home and its people. In the Pacific Islands of the Marianas, family names are not only valued, they are cherished. So many folks are not only known by their surname, but they go further to define a particular branch that they belong to, in order to be easily recognized by others. Ask any Chamorro you meet what family they belong to. Not only will they say their official surname, but they will likely follow it with “familian [you add the name]”. Most will be able to quickly reconcile what branch of the tree they belong to, among the many trees and branches that make up Guam’s rich genealogical records. This is a custom illustration that can be purchased and customized with your family name. This design depicts a stained glass spiritual theme. Click the image to order. Take for example my family. I’m from the Aflague clan. Not much is known as to the origins of my surname, however, to differentiate my branch from another branch within my clan, they’ve identified my father’s branch to be from the Katson group, also known in Chamorro as “I familian Katson”. I was told that my branch name actually came from the Flores clan. I’m not sure how accurate that is. But it makes sense. My grandfather’s middle name is Flores. For those who may not know, my grandfather was the first goldsmith on Guam, back in the early years, who made hundreds if not thousands of pieces of jewelry for many old time Guam families. In fact, many knew the jewelry made by my grandfather as “I alahas Katson”, which means “Katson’s Jewelry”. I run into a few folks from time to time who have said that they still have a wedding ring, or bracelets made by my grandfather. I was not born when my grandfather was in the business of jewelry making, however, he took his passion as a goldsmith very seriously and made it a venture that allowed my family to prosper and enjoy the fruits of their labor. His daughter, Mariquita, eventually took the reigns of the business and furthered their efforts into the 70s in Guam. If any of you are reading this and still have any of his pieces, please let me know. I’d be interested in seeing some of his designs in picture. I know this is a long shot, but you never know what you are going to get, unless you ask. 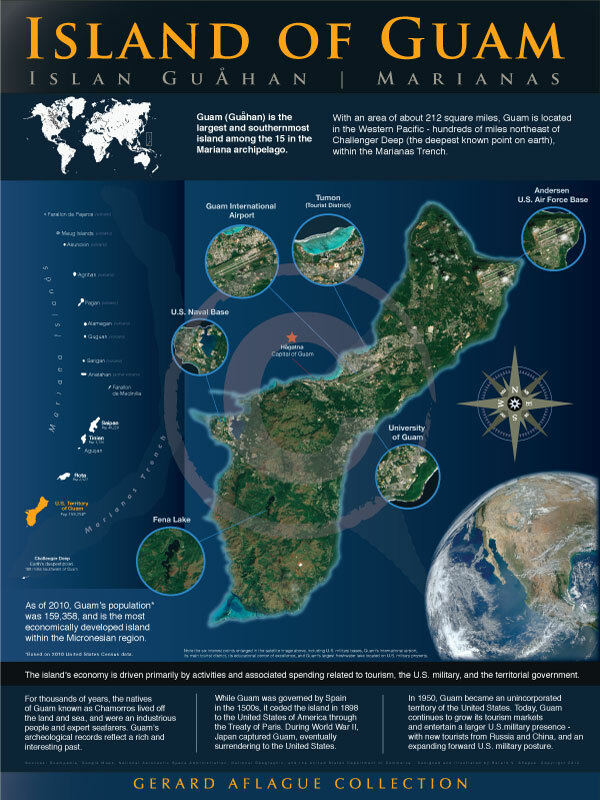 This is an illustration depicting a tropical setting with the island of Guam inset. We customize this illustration with your family names. Click this image to order now. If the name Katson rings a bell in another way, its because my family are the long time entrepreneurs of Chorizos Chamorro. Going back to the 60s and 70s, my father’s brother, Vincente or “Ben”, went into the sausage making business with his sons. From there, his sons and others formed a sausage factory in front of the old Marks Department Store on the beach side of Anigua in the 70s. I distinctly remember their big delivery truck with the logo that had the “Katson’s Chorizos Chamorro”, with a cute picture of a cartoon pig face as their mascot. This business has now gone national after many decades, and is based out of California through a partnership with the Calvos in Guam. My first cousins and their nephews are now taking part in this venture. So as can be seen, family names in Guam hold more value than most western cultures, as folks seem to dig deep to uncover the underlying connections that become less and less apparent as new generations of families develop. This unique aspect of our familial connections make for enjoyable conversations at parties and get-togethers with other families. If you don’t believe me, just observe at an upcoming Chamorro gathering and hear the initial conversations of strangers meeting up for the first time. I’ll bet that they will share these two pieces of information to form the basis of where they both came from.You’ll see them introducing themselves, telling each other what their last names are, followed by their family names. It’s intriguing to say the least. If anything, its an ice-breaker of sorts. Afterward the real conversations begin. This is an illustration depicting a tropical setting with the Saipan island. We customize this illustration with your family names. Click this image to order now. So as was mentioned, in the Pacific Islands, clan names, and family names hold a very special significance in the lives of our people. We use it to connect, to categorize, and to be identified more easily. Because of the value that I know Pacific Islanders put on their geneology, I’ve produced a few illustrations that can be customized with family and clan names. This is an opportunity for folks to display not only a representation of where they come from in a colorful tropical theme, but also to be able to proudly showcase who they are as pacific islanders. These two elements come together to provide something unique, it is nothing short of a conversation piece. I envisioned these illustrations as a one-of-a-kind gifts to other families who would find this more than just beautiful. Set in an 18″x24″ frame, and hung in your home’s foyer or living room, it is a testament to who you are and where you come from.These pieces are Giclee illustrations that depicts the look of stained glass, however, they are printed on museum quality illustrated stock. If you want to be one of the first ones to have your name customized on one of these one-of-a-kind unique stained glass design illustrations, or if you want to order one as a unique gift to someone special, click one of the images above for more ordering information. If anything, please leave a comment below. I’d be interested in what your perspectives are of the significance and value of family names in the Pacific Islands. Adios for now!